US President Barack Obama made a well-publicised visit to two Asian countries in May 2016 – Japan and Vietnam. Specifically, he toured Hanoi, addressed the Vietnamese national congress and its ruling Communist Party, and then went on a historic tour of Japan. He became the first sitting American President to visit Hiroshima. His visit and speech at the atomic bombing site of Hiroshima garnered enormous media attention and debate. In particular, Obama’s refusal to issue an apology for the atomic attack on Hiroshima generated heated discussion and tensions both within the media, and within political and academic circles. This issue has been extensively discussed; I have stated my position on that question in this article. While this is an important topic, it distracts from other, equally important issues that merit attention. It is to these unexplored issues to which we shall turn – namely, Obama’s visit to Vietnam. As President of the United States, Obama can visit any country that will take him, and that is fine. 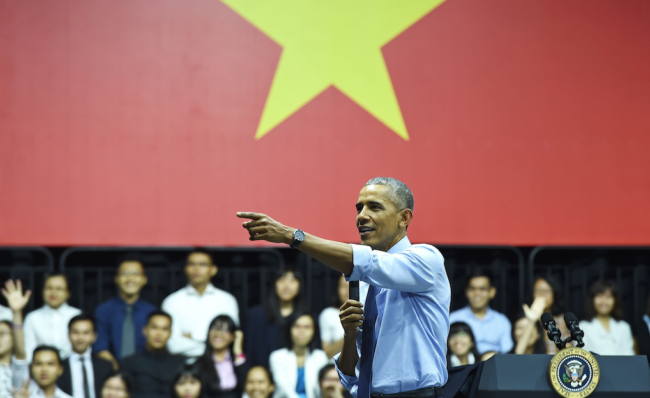 Given the long and tortured history of the relationship between Vietnam and the United States, Obama’s May 2016 trip will appear to be an exercise in mending fences. It is always commendable when two former adversaries resolve their differences and arrive at a form of reconciliation. Diplomatic relations between the two former enemies were restored in 1995. However, there are a number of points to note about his trip to Vietnam. If we may use a sporting analogy – the contests between two adversarial boxers is normally a fight between evenly-matched fighters. Two heavyweight athletes, for instance, are pitted against each other, each with relatively corresponding strength and skills. The better boxer emerges victorious during the pugilistic context. The United States is a military heavyweight – and it deployed its enormous military forces against a military featherweight, Vietnam, throughout the 1960s and 1970s. From the mid-1960s until 1975, the United States ruling class unleashed its full military might – aerial firepower, ground troops, chemical weapons, CIA subversion programmes – against the people of Vietnam. Not only did three million Vietnamese lose their lives, neighbouring Laos and Cambodia were also targeted and ravaged by US aerial power. The environment of Vietnam was polluted by a combination of toxic chemicals, and their effects remain until this day. It should also be mentioned — since it will be suppressed during the commemoration — that U.S. forces, including the CIA and the Pentagon-controlled South Vietnamese military, tortured many thousands of “suspected” supporters of the liberation struggle, frequently with portable electrical current. An estimated 40,000 “Vietcong” (suspected members or supporters of the NLF) were murdered during the long-running “Operation Phoenix” assassination campaign conducted by the CIA, Special Forces and killer units of the Saigon forces. The Vietnamese, through sheer determination, courage and willpower, not only resisted the American onslaught, but inflicted a humiliating defeat on the US armed forces. Since the war ended in 1975, Vietnam has concentrated on rebuilding its shattered society and economy. From the mid-1980s, the Vietnamese authorities have opened up Ho Chi Minh city to foreign capital, attracting foreign investment, allowing foreign multinationals to open factories and invest, and embarked upon its Doi Moi (renovation) policy, creating what Hanoi calls a ‘socialist market economy’. The merits and demerits of this policy, and the evolution of the Vietnamese Communist Party since the 1980s is beyond the scope of this article. However, Obama’s visit to the Vietnamese capital is not just a friendly visit, as stated by Professor TJ Pempel from the University of California, Berkeley. 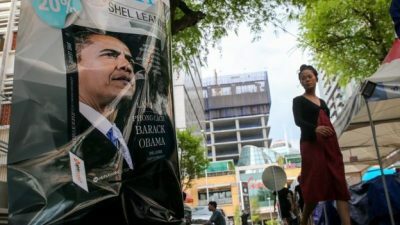 Obama was indicating his desire to upgrade US relations with Vietnam, refocus America’s strategic priorities to the Asia-Pacific region, and include Vietnam in the US pivot to China. The South China Sea is a clear case of classic geopolitics. It metaphorically sits alongside the Panama Canal, the Straits of Gibraltar, The English Channel, Suez and the Straits of Hormuz as one of the world’s maritime choke points. More than half the world’s merchant fleet traffic passes through the South China Sea. If China has total control then it can effectively cut off Japan and South Korea from Europe, Australia, India, the Middle East and Africa. It can also sever the link between India, Southeast Asia and the West Coast of America. Then there is the oil and gas. There is as much oil in the South China Sea—seven billion barrels proven so far—as in all of Saudi Arabia. There is also 900 trillion cubic feet of natural gas. While the South China Sea has its own history and dynamic, it can be resolved through the framework of the United Nations Convention on the Law of the Sea. Interestingly, the United States is not a signatory to that convention, but wishes to intervene aggressively in a maritime dispute over which it has no jurisdiction. However, Obama’s sales pitch to the Vietnamese authorities is not purely a defensive reaction with regard to a maritime conflict, but rather a calculated attempt to seek closer ties with a historic rival, and use Vietnam’s existing tensions to cobble together an anti-Chinese alliance. 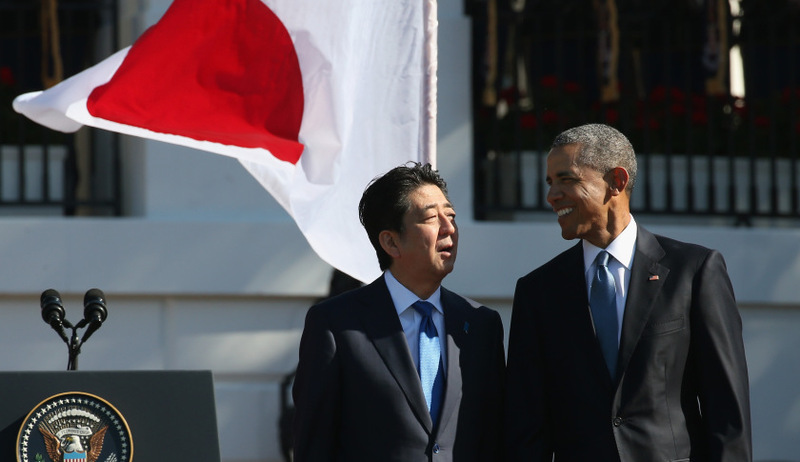 The Obama administration’s pivot to Asia is not just about winning new friends, but seeking out regional alliances in order to further strategic economic and political goals. Why is all this relevant to Australia? Australia is not only an enthusiastic supporter of America’s wars overseas, but was an active participant in the Vietnam war. When the United States launched its first attacks on North Vietnam in the early 1960s, Australia eagerly sent a team of military advisors – the Australian Army Training Team (AATTV) in 1962. This team, along with American special forces, actively assisted and participated in, among other things, CIA initiatives, like the Phoenix Programme alluded to above, to disrupt the structure of the National Liberation Front of Vietnam – informally known as the Viet Cong – through torture, assassination, infiltration and terrorism. In 1965, then Prime Minister Robert Menzies actively sought and acquired the approval of the Americans to increase Australia’s military commitment to support the United States in Vietnam. Menzies, through his ministers and officials, badgered and cajoled the relevant American and South Vietnamese authorities to push for an escalation of Australia’s military involvement. While the government of the Saigon regime formally invited Australia to participate, this was done as a result of back-room machinations and arm-twisting of the Australian government, who eagerly pushed their way into being ‘invited’ as a military participant in the Vietnam war. From the early 1970s, as the American assault on Vietnam was facing imminent defeat, refugees began fleeing from that country. Australia, one of the aggressors in that conflict, initially refused to take Vietnamese refugees, given Australia’s long-standing opposition to Asian immigration. The image of the ‘yellow peril’ was a long-standing staple of the xenophobic diet of white Australia. Australian Prime Minister Gough Whitlam urged his parliamentary colleagues to reject entry to the ‘f**king Vietnamese Balts’ – a reference to the earlier Baltic refugees of anti-socialist (and Nazi collaborator) persuasion. 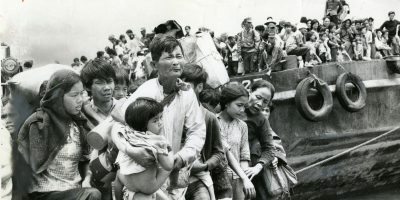 In the mid-1970s, after the complete collapse of South Vietnam and the withdrawal of American military forces from Vietnam, Australian Prime Minister Malcolm Fraser did accept a small proportion of the thousands of Vietnamese refugees. Not that Fraser was motivated by humanitarian considerations, or that he was particularly generous or proactive – on the contrary. Fraser went out of his way to reassure his parliamentary colleagues and voter base that he was permitting only a minuscule portion of the Vietnamese refugees, and that they in no way represented any kind of threat to the ‘Australian way of life’. 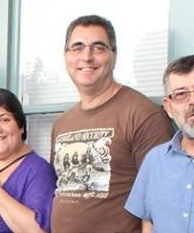 Senior Fraser government officials, including then immigration minister Ian Mcphee, stated that the Vietnamese refugees were not fleeing persecution, but actively seeking a better quality of life, implicitly accepting the premise that what motivated the Vietnamese asylum seekers was not an urge to survive, but greed for Australian prosperity. After all, the American government has paid compensation to its own Vietnam veterans who continue to suffer the impact of Agent Orange and the toxic chemicals used by the US military forces in Vietnam. Let us end the distorting perspective of those who suggest that the United States ‘could have won in Vietnam’, that America ‘had one hand tied behind its back’ over there, that the politicians somehow ‘betrayed’ the front-line troops. Let us have an honest accounting of American savagery in that conflict, and seek out ways to prevent such wars in the future.